Dr. Caes undertook her graduate training (2008-2012) at Ghent University, Belgium, funded by the Funds for Scientific Research in Flanders. 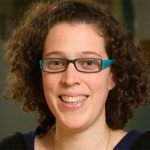 Her dissertation was awarded “Le Prix de Psychologie, these de psychologie scientifique, 17th periode treinnale, 2010-2012” awarded by Academie Royale de Belgique. She is also the recipient of “The Southwood Adolescent Chronic Pain Visiting Studentship Award 2012”, supporting an extended visit to the Centre for Pain Research at The University of Bath, UK. From October 2012 – July 2014, she was a post-doctoral fellowship at the Centre for Pediatric Pain Research, Halifax, Canada, funded by the Louise and Alan Edwards Fellowship in Pediatric Pain Research. Line is currently a Lecturer in the School of Psychology at NUI Galway, where she contributes to research and teaching of Health Psychology, in the postgraduate programs in Health Psychology as well as in the undergraduate degree programmes in Occupational Therapy and Speech and Language Therapy. Dr. Caes’ research interests are focused on the psychosocial aspects of pediatric pain, such as the role of family functioning and parental characteristics in explaining parental behaviour in response to their child in pain and the subsequent impact on their child’s level of pain.